It’s been another week where life has got in the way to my photo taking….I’ve literally not had a spare second, but I like to be busy so that’s not a bad thing. I’m still in denial that Easter is next weekend, this term has zipped by at a crazy speed, and been as wonderful as it’s been exhausting. I think we’re completely at our limit with extra curricular activities and stretched so thin out of school time that we’re all in desperate need of a break, but the girls are doing so well at school, especially little Sydney who never fails to surprise me with her determination and creativity and I can Hannah’s confidence growing day by day. Zak as always is my challenge, if anyone has advice for dealing with bright, restless 8 year olds let me know..
One of the funny things about having slightly older children are the things you find lying around the house that you had no idea existed. Sometimes when everyone is out I spend a quick five minutes walking around looking for little scribbles. 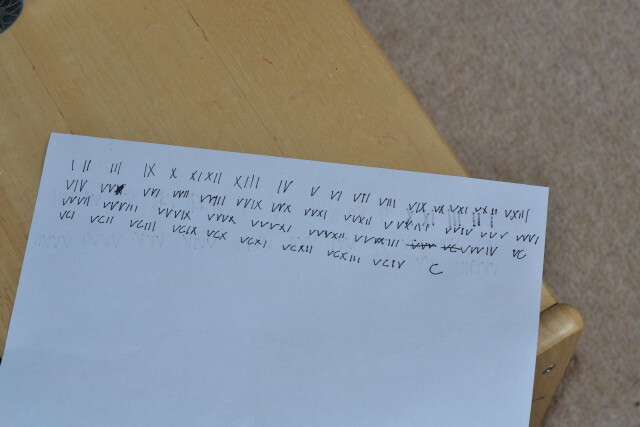 This week I discovered that Zak has been practising writing in Roman numerals…. I have no idea what this is about….but i’m quite impressed with the writing! Life is never dull, that’s for sure. Heh heh I love the little notes that I find around the house – really random things. I’ve started leaving daft pictures on post it notes around in Kit and Ozzys bedrooms just to freak them out back! We have just moved house and while cleaning the old place I found some odd stuff that I had stopped noticing – there was a pencil drawing of a horse stuck low down on our bedroom door with the word ‘one’ written under it – no idea why! And an arrow with ‘to the cave’ scribbled on it stuck to a skirting board with blu tack! Oh haha! I love that second note – I wonder what that was all about?! 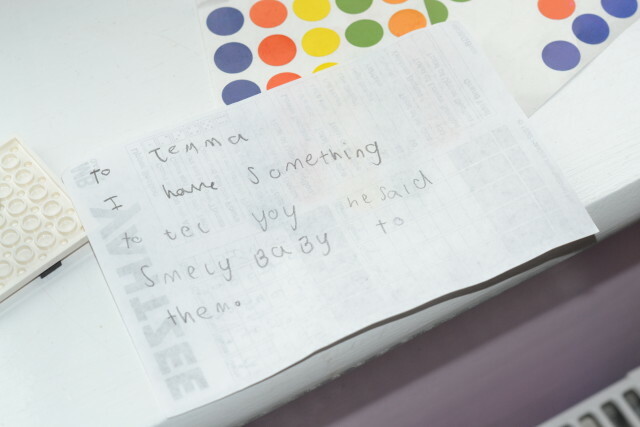 Tom is only just learning to write, but he keeps notebooks stashed all over the place for practicing writing in, both stories and pictures. I found one the other day called ‘The Story That No-One Liked’ which made me giggle.